Happy Mother’s Day! If you’re a mama, I hope you’re enjoying a relaxing day to yourself or spending it with the little ones. Mother’s Day is like any other holiday in my family. I cook a lot of food and everyone eats it. All the moms get a night off cooking and cleaning, and I add another successful dinner to the books. Normally, Mother’s Day is an ideal time to use all the colorful spring produce and make a pretty brunch or breakfast. 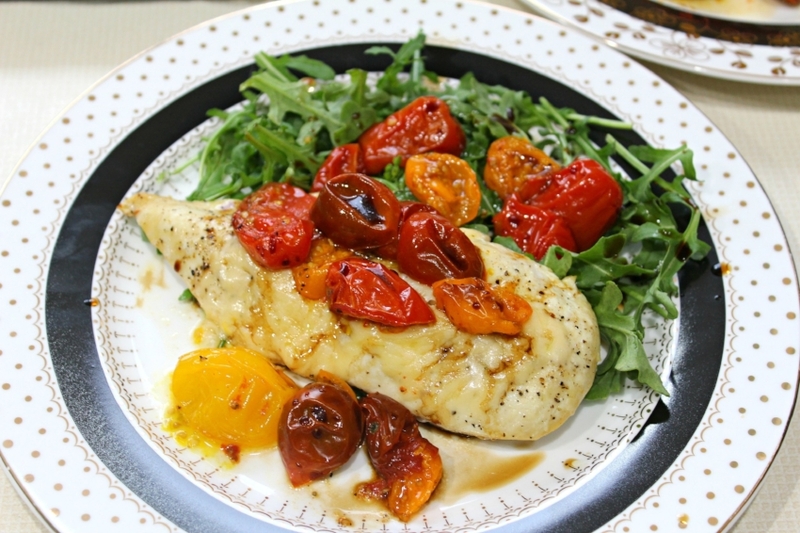 Sadly, since winter only ended three weeks ago our spring produce is coming in rather slow which makes recipes like this Roasted Parmesan Chicken with Tomatoes & Arugula ideal. It’s also perfect for moms who need to get dinner on the table quick on weeknights. It’s a light, flavorful meal that doesn’t take long to prepare and only takes a total of 5 ingredients (plus S&P). Tomatoes are at their peak season in August but with sustainable glasshouse farming like Chicago’s MightyVine Tomatoes, their accessibility year-round is rising. Tomatoes can add a lot of great flavor and depth to a dish. There’s a reason why Italians use them as the main ingredient for pasta sauce. Roasting tomatoes brings out all that sweetness and bright flavor, making this a great spring dish. It’s also simple and some of the best spring meals are the simplest. A little arugula drizzled with some balsamic and you’ve got yourself a tasty dinner that gets on the table fast. For the chicken, I like to buy thin-cut breasts. Full chicken breasts are too much for one person in my family and they take much longer to cook. The thin-cut breasts are the perfect size and they cook fast. The less time you need to cook chicken, the less room for error there is. No one likes dry chicken. When the chicken is finished cooking or almost done, sprinkle the Parmesan cheese on top and return it to the oven to cook a little longer and melt. It will create a nice, cheesy crust that’s gooey and gives the roasted tomatoes something to stick to. The tomatoes and chicken can roast on the same pan. Cherry tomatoes have a lot of great flavor for roasting and they cook fast, especially when they are halved. Overall, this is a really simple dinner that only calls for a sheet pan to prepare. Use some tin foil to coat the baking sheet and the only dishes you’ll have to wash are the plates! That’s what I call a perfect weeknight dinner. After all, who wants to spend tons of time in the kitchen when you can be enjoying a beautiful night on the back patio sipping a glass of wine? No one. That’s who! 1 - Preheat the oven to 400 degrees. Prep a baking sheet with tin foil. 2 - Rub the chicken (or use a pastry brush) with olive oil and season generously with salt and pepper. Place the chicken breasts on one side of the baking sheet. On the other, toss the tomatoes with olive oil, salt and pepper. Place the baking sheet in the oven and bake for 20 minutes. 3 - Check the chicken. It should be almost done or just done cooking. Divide the Parmesan cheese evenly over each chicken breast, sprinkling over the top. Place back in the oven to finish cooking and melt the cheese. Once the cheese has melted, remove from the oven and let sit for five minutes. 4 - While the chicken cools, lay a bed of arugula on each plate. Top with the roasted tomatoes and chicken. Optional: drizzle with a little olive oil or balsamic vinegar to finish. Serve.